Synopsis: Two young women are attacked in their dorm room at the local college. The only motive seems to be that they played a reality/virtual reality game. At almost the same time Leonard’s bookshop is vandalized. Although these crimes don’t seem connected, Frank Nagler thinks they just might be. Review: Set in the down-but-not-out city of Ironton, New Jersey, this rather hard-boiled cop story also examines the topics of violence on college campuses and nepotism within city departments. This is the second in the Frank Nagler series and shows the growth of the writer; it’s an enjoyable novel with a good ending. 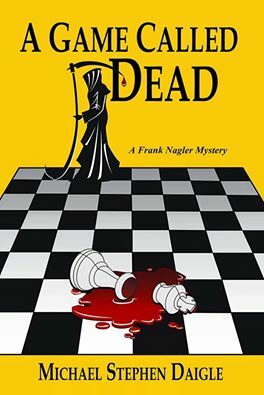 “A Game Called Dead” is the second Frank Nagler Mystery, following “The Swamps of Jersey.” (2014), both published by Imzadi Publishing of Tulsa. Bobby’s News and Gifts, 618 Main Street, Boonton. The books are also available at the at the following libraries: Morris County Library; Somerset County Library System; Bernardsville Public Library; Hunterdon County Public Library; Mount Olive Public Library; Phillipsburg; Warren County, Franklin branch; Mount Arlington; Wharton; Dover; Hackettstown; Clark, and the Ramsey library, as part of the Bergen County Cooperative Library System. This entry was posted in Fiction, Imzadi Publishing LLC, Michael Stephen Daigle, Mystery Writers of America, www.michaelstephendaigle.com and tagged "A Game Called Dead", "The Swamps of Jersey" Imzadi Publishing, Fiction. Bookmark the permalink.